MELBOURNE, Australia — Tiger Woods doesn't quite know how to thank his Presidents Cup teammates for the role they played in lifting him out his injury funk a year ago. Ranked 1,142nd in the world when he arrived at Liberty National in New Jersey last September, where he served as an assistant to U.S. captain Steve Stricker, Woods delivered a grim and honest press conference. He conceded retirement was a possibility. The 14-time major champion, who was still smarting from his spinal fusion, needed a pick-me-up, and, boy, did he get one. Woods says he was inundated with heartfelt support by members of the U.S. team during that period — offers to fly to Florida and play practice rounds with him, to bang balls with him on the range, even to buy him dinner. The goodwill worked. 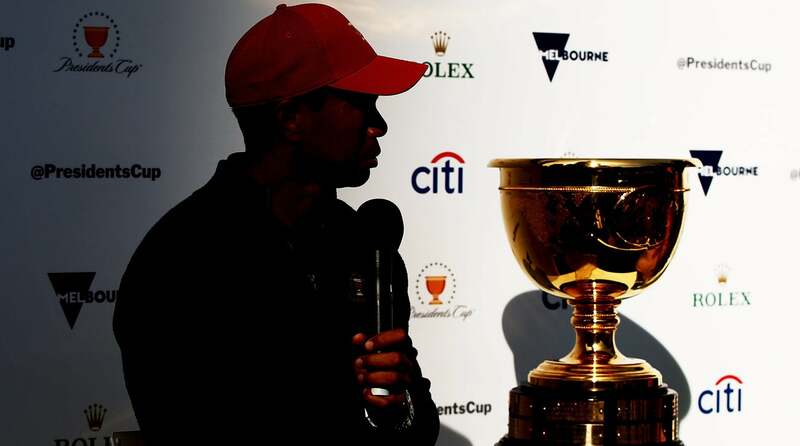 "It played a significant role," Woods said Thursday at Royal Melbourne, where he was on hand to preview the 2019 Presidents Cup. "The guys were very supportive … the text messages and calls I got last year through to the Presidents Cup were very uplifting. They just wanted to make me part of the game again because I didn't know if I could do it or not." Tiger Woods took a trip to Royal Melbourne in Australia to promote the upcming 2019 Presidents Cup, where he will serve as U.S. captain. One week after the U.S. thumped the Internationals at Liberty, Woods posted his "smooth iron shots" video on social media. Five months later he showed promising signs on the Florida swing, highlighted by a T-2 finish at Innisbrook. And in September — less than a year after that gloomy Presidents Cup presser — Woods won his 80th PGA Tour title at the Tour Championship. He is now ranked 14th in the world. If you've detected that Woods is also cheerier and more engaged with fans, well … Woods has detected that, too. He's smiling more, chatting more, and signing more hats and programs. "Twenty years ago, it was a totally different deal; I was trying to compete and beat everyone," Woods said. "Now, I'm appreciative of having the opportunity to come back and play. I'm thankful to be a competitor again." And a dangerous one at that. In 2018, Woods notched a pair of runner-up finishes, including at the PGA Championship, and seven top-10s. He described the scene on the 72nd hole of the Tour Championship, when thousands of fans trailed him up the fairway, as "one of the more special moments I've had in my entire career." "The atmosphere has been so different, so appreciative and electric and I have felt that," he said. "Maybe they realized I may never have played again." Woods said one of the biggest takeaways from his 18-event schedule in 2018 — one of the busiest seasons of his career — is to play less next year. "I'm trying to pace myself next year, do a better job of that with the entire 12 months," he said. "Hopefully, I learned my lessons this year." Drop Zone: Is 2018 the most important year of Tiger’s golf life? As for where Woods will kick off his 2019, he was evasive when pressed about the idea of playing the Tournament of Champions on lovely Maui for the first time since 2005. "I like where you're trying to go," he said, smiling. "I haven't quite formalized my plans yet. But I will let you know."